Getting off-the-beaten-path in Colombia is often easier said than done. Transport to some of the more remote areas can present challenges, especially when traveling by bus. Long-distance road travel by public transport often means traveling along windy mountain roads at high speeds and passing other vehicles on blind turns. But the adventure is all part of the experience, and once you arrive at your chosen destination you'll find the journey to have been well worth it. To ease the burden of difficult travel, consider hiring a private vehicle and driver. The following options can be added as overnight trips from the main hubs, or places to visit as part of a regional tour. Be sure to plan a day or two in advance; most of these locations make for great weekend getaways (and local hotels can fill up). All locations on this list are well-serviced by local transport. Most visitors spend their time in Antioquía visiting the big ticket sights in Medellín, which is a shame because they are missing out on one of the best experiences in the region. Just three hours south of Medellín is the gorgeous town of Jardín, where picture-perfect scenes appear every time you turn your camera lens. Cradled on a mesa amid rugged banana and mango plantations, this is an ideal place to get away from the hustle and bustle of Medellín. Jardín is one of the best-preserved colonial towns in Colombia. The idyllic central plaza, known as Principal Park, is paved with river stones. 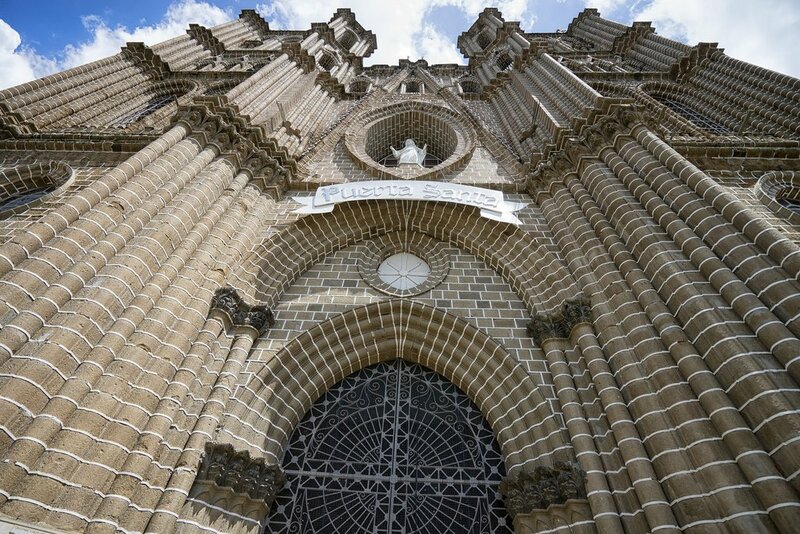 The grand cathedral that fronts it is the neo-Gothic Templo Parroquial de la Inmaculada Concepción – it’s impossible to miss its twin steeples. All around town, colonial homes impress with their wooden balconies and brightly colored zocalos (painted trim along the bottom of a home). One of the main activities here is people-watching and there is plenty of scope for this at Principal Park, which is lined with cafes and restaurants. Adventurists can try repelling in the stunning Cueva del Esplendor, where a mammoth waterfall crashes into a beautiful natural pool inside a cave. If you don’t mind heights, be sure to take a garrucha (cable car) up the mountains above Jardín, where you’ll enjoy panoramic views of the surrounding Antioquian verdure. It's worth bearing in mind these rickety old boxes aren’t for the faint of heart. 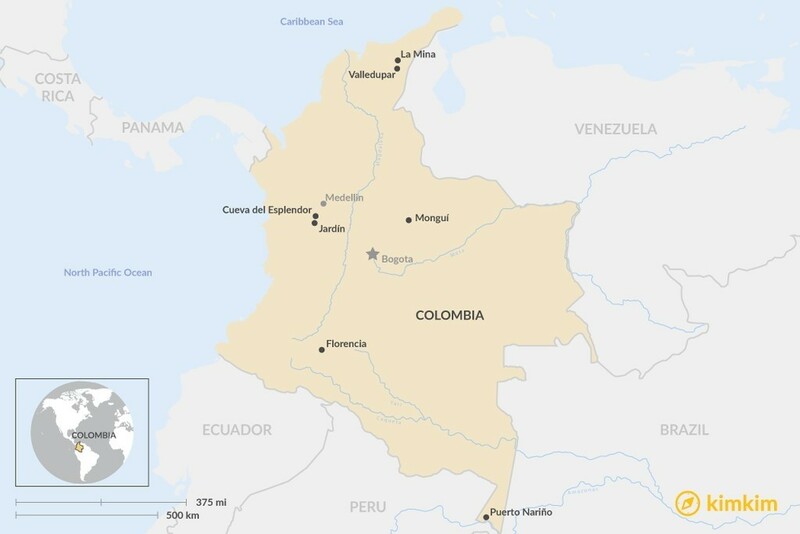 Jardín is located 80 miles (128 km) south of Medellín. It can be visited en route to the Coffee Country. Best way to reach here: Drive from Medellin (2 hours) or take public transport (3 hours). Best time of year to visit: Year-round. Jardín makes a great weekend trip, as there are often festivals and equestrian shows on weekend nights. The impressive Basillica of Our Lady of Monguí. 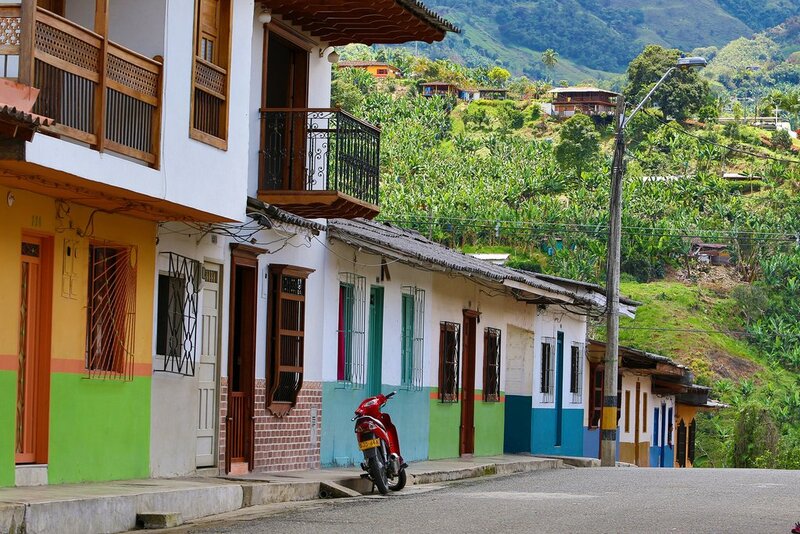 The pretty town of Monguí, about 10km from the popular cycling area of Sogamoso, is an official Heritage Town of Colombia. This isn’t surprising, as the pueblo appears to have changed little since its founding in 1601. After crossing the adobe bridge over El Morro River, and winding around narrow cobblestone streets and colonial homes, you begin to understand what life here must have been like centuries ago. The town itself is centered around the Basilica of Our Lady of Monguí, a colonial church as impressive as any in the country. But Monguí isn’t merely a set piece — there’s industry here. The town is known for manufacturing footballs, and there’s no shortage of stores selling the items. Also, ruanas (thick wool blankets) are manufactured in abundance and make for a great defense against the chilly highland temperatures, the average being 12°C. Public buses run every 20 minutes from Sogamoso to Mongui, or you can book a day tour through a tour operator. Monguí is located 75 miles (121 km) from Villa de Leyva, Monguí is best visited if you have 2 or 3 days to travel in Boyacá department. You can also stop here en route to Parque Nacional Cocuy. 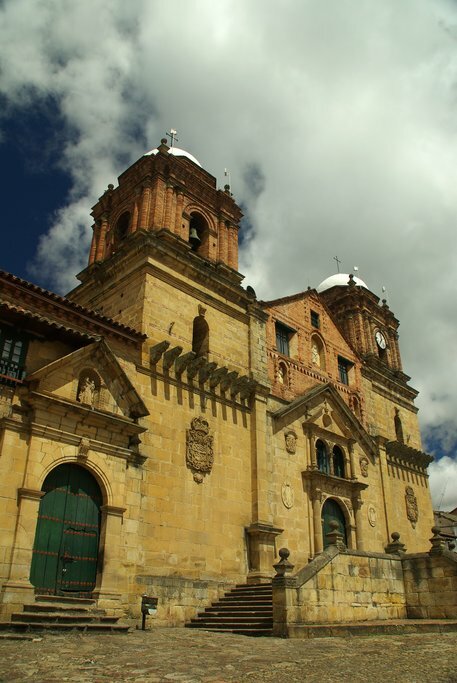 Best way to reach here: Drive from Bogotá (3.5 hours), or take a day tour from Villa de Leyva. Best time of year to visit: Year-round, but try to avoid December, when the area is inundated with holiday-makers from Bogotá. 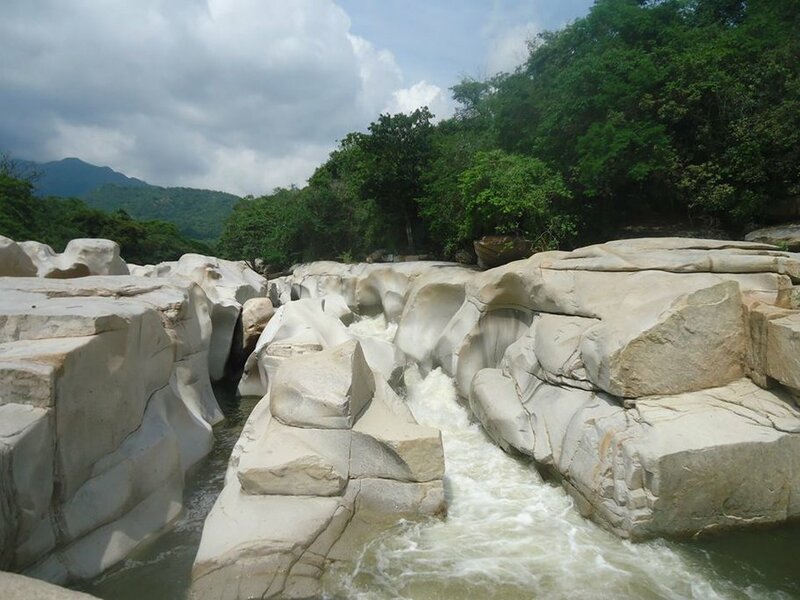 The rushing waters of La Mina are a popular place to cool off. The pulse of Colombia can be felt in its music. But the country’s flagship styling, salsa, is just one of many genres here. Vallenato, a folk style that mixes European, African and indigenous elements, was born in the town of Valledupar, located between the adventure-sports haven of Bucaramanga and the coast of the Guajira Peninsula. Valledupar is at once temperate and arid, fresh and hot. To beat the heat many locals visit La Mina, a section of the Río Badillo, some 40 km north of town. Here great white stones rise up out of the water like teeth, creating luxurious natural pools as well as rather harrowing diving platforms. Relax in the water and watch the local kids impress with backflips and other daredevil feats. Every year, Valledupar plays host to the Fiesta Leyenda Vallenata, a vallenato festival held in Parque de la Leyenda. For four days, tens of thousands of spectators revel in music and merriment, during which the country’s hottest vallenato acts whip the great crowds into a frenzy. It’s the largest music festival in the country, and you don’t want to miss it. 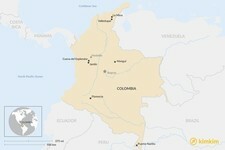 Valledupar is located in northeast Colombia near the Venezuelan border, it's quite a long way off the main traveler routes. Best way to reach here: A bus ride from Cartagena takes about 5.5 hours. You could also take a bus from Bucaramanga (7 hours) and then travel onward to Cartagena. Or, you could visit as part of a 3- or 4-day trip that includes Riohacha and Santa Marta. Best time of year to visit: During the Fiesta de la Leyenda Vallenta, the annual vallenato music festival. View of Puerto Narino with the Amazon River in the background. 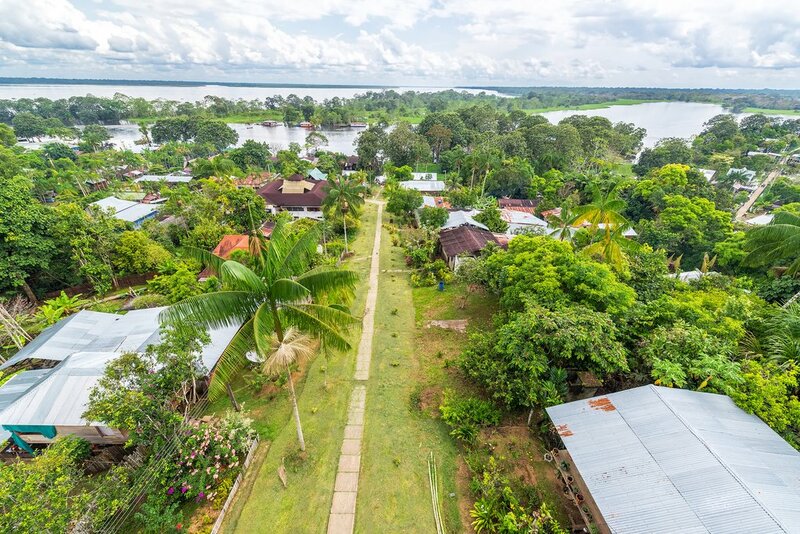 With the arrival of cheap flights from Bogotá to Amazonas, many travelers are finding it easier than ever to visit that great river of South America – the Amazon. But many visitors limit themselves to day trips around the region from Leticia. This is a shame, because about two hours west by water taxi lies the picturesque village of Puerto Nariño. Intrepid travelers that make it this far can indulge their inner Indiana Jones by partaking in a number of excursions and adventures. Activities include a night tour of the jungle, featuring all the creepy crawlies you can imagine. Many of these creatures, such as the poison dart frog, are lethal (especially the golden ones). You can stay with a local indigenous family and watch as they clean a giant piraracu – the largest freshwater fish in Colombia. There’s no shortage of flora and fauna to explore here – about half of Earth’s plant and animal species can be found in the Amazon Basin. Other Amazon activities on offer in Puerto Nariño include wildlife watching (including caiman, a type of alligator) or fishing for piranha. Puerto Nariño is located 48 miles (77 km) from the town of Leticia, deep in the Amazon region. A speed boat from Leticia takes two hours. Best way to reach here: Water taxi from Leticia (2 hours). Best time to visit: During the low-water season from June to September. Otherwise the Amazon River water levels swamp most of the town. Florencia, located 4.5 hours southeast of Popayán by taxi, isn't mentioned in most guidebooks, so any visitor that arrives is something of a novelty. Explore the streets and meet the friendly locals in their shops and cafes. Located between the muscular Andes and the untamed jungles of the endless rainforest, this well-preserved colonial-era city also has good potential for eco-tourism. You can relax in the natural pools of Spa Las Pailas or hike to waterfalls. There's also wildlife spotting at the Bosque de la Microcuenca de la Quebrada la Resaca, a 400-hectare reserve with a number of protected animal species, including turtles and monkeys. Other activities include ferrying down the Río Orteguaza (a tributary of the Amazon) in a riverboat, or view the “El Encanto” petroglyphs in the Torasso neighborhood of the city. Foodies can indulge in some gastronomic delights of the region, such as sancocho de gallina, a rich chicken soup made with farm hens, potatoes, yucca and maiz. The town also features ethnographic museums, including the Museo y Sendero Histórico del Caquetá Felix Artunduaga Bermeo, where you can familiarize yourself with all things Caquetá, the department in which Florencia is located. Florencia is located 4.5-hours drive southeast of Popayán. It can be visited as part of a tour of southeast Colombia. Or it makes for a good weekend trip from Popayán. Best way to reach here: Bus from Popayán (3 1/2 hours). Best time to visit: year round. Florencia enjoys an average temperature of 27°C all year.